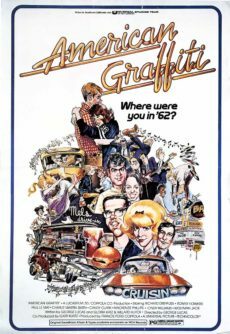 Laemmle Theatres and the Anniversary Classics Series present a 45th anniversary screening of one the most beloved comedies of the era, George Lucas’s AMERICAN GRAFFITI. The film earned five Oscar nominations in 1973, including Best Picture, Best Director, Best Original Screenplay, and Best Supporting Actress Candy Clark, and it was a box office smash, despite the studio’s nervousness about the film’s innovative structure and largely unknown cast (all of whom would go on to have extraordinary careers). “Where were you in ’62?” was the advertising tag line for the movie, and it tapped into the nostalgia that many Americans felt for a more innocent time, before all the violent upheavals of the late 60s and 70s. Set around Lucas’s home town of Modesto, California, the film follows a group of friends on a single night before two of them are scheduled to leave for college. They cruise the main drag and have a series of wild and sometimes dangerous adventures before dawn forces them all to a reckoning with both their past and their future. 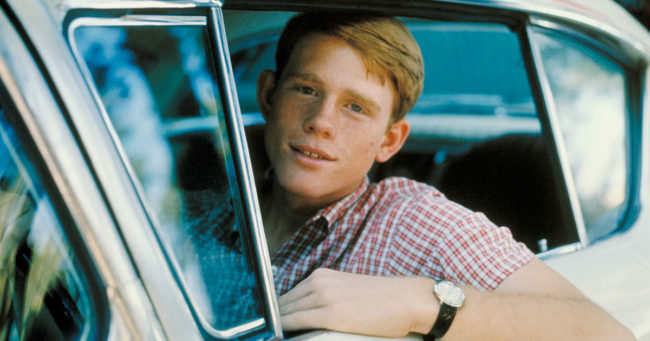 Those “young principals” include Ron Howard, a former child star and future Oscar-winning director; Richard Dreyfuss, who would win a Best Actor Oscar four years later; Cindy Williams, who would star in the hit TV series, Laverne and Shirley, later in the decade; Harrison Ford, who would soon become a megastar in Lucas’ Star Wars and other films; Candy Clark, Paul LeMat, Charles Martin Smith, Mackenzie Phillips, and Bo Hopkins. The behind-the-scenes team was equally impressive. Fresh off his triumph on The Godfather, Francis Ford Coppola acted as producer, along with Gary Kurtz. The impressive night-time cinematography was by Oscar winner Haskell Wexler, credited as “visual consultant.” The film’s Oscar-nominated editors were Marcia Lucas and Verna Fields (later an Oscar winner for Steven Spielberg’s Jaws). 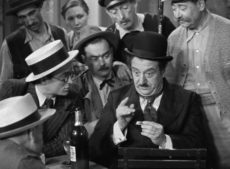 The musical score—a non-stop medley of 1950s and early 60s hits—provided delightful punctuation to the action, with commentary by real-life deejay Wolfman Jack, who makes a memorable cameo appearance late in the film. Many later films followed the template created by American Graffiti of having all the action take place over a single day or night. These hit films, which might never have been financed without the success of Lucas’s film, include several John Hughes movies (The Breakfast Club, Ferris Bueller’s Day Off) and Richard Linklater’s Dazed and Confused. Willard Huyck and Gloria Katz also wrote the screenplays for Radioland Murders, French Postcards, and the Lucas-Spielberg production of Indiana Jones and the Temple of Doom. 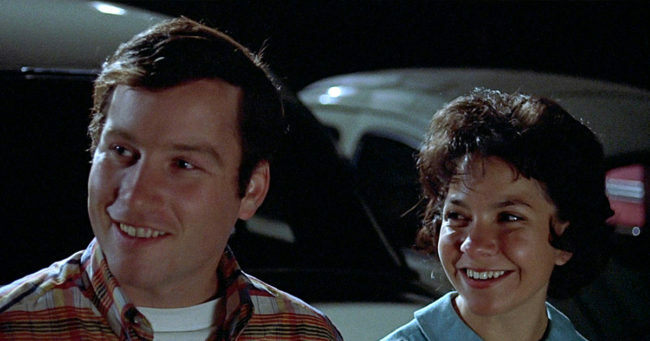 Candy Clark, who earned an Oscar nomination for her engaging performance in American Graffiti, co-starred with David Bowie in Nicolas Roeg’s The Man Who Fell to Earth and also appeared in Jonathan Demme’s Citizens Band, Blue Thunder, At Close Range, and David Fincher’s Zodiac. Charles Martin Smith co-starred in The Buddy Holly Story, Never Cry Wolf, Starman, and The Untouchables. More recently, he has written and directed for both film and television. 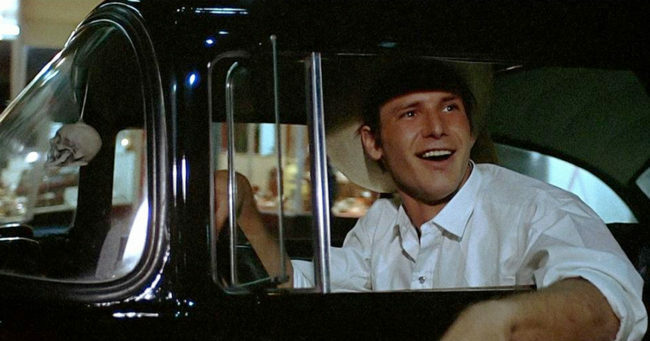 AMERICAN GRAFFITI screens Tuesday, October 23, at 7:30PM at the Ahrya Fine Arts in Beverly Hills. Oscar-nominated screenwriters Willard Huyck and Gloria Katz and co-stars Candy Clark and Charles Martin Smith will participate in a Q&A at the screening. Click here for tickets.